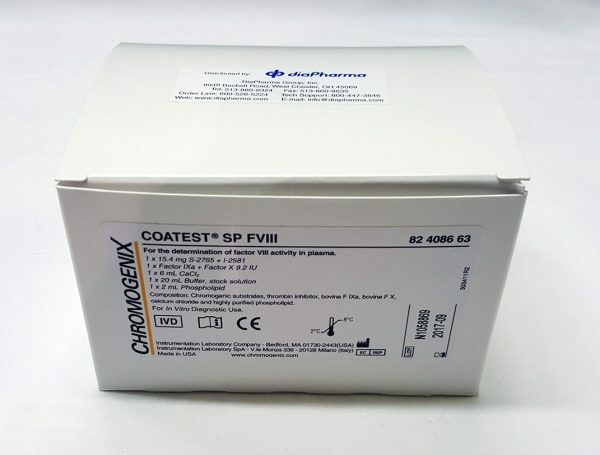 Chromogenix Coatest® SP Factor VIII is a chromogenic assay kit for the in vitro diagnostic photometric determination of factor VIII activity in citrated plasma, such as when identifying factor VIII deficiency or monitoring patients on replacement therapy, as well as for potency estimation of FVIII concentrates. This factor VIII test kit has two measuring ranges plus validated and documented protocols for a wide range of instruments. S-2765™ 15.4 mg + I-2581, 1 vial. Chromogenic substrate (N-a-Z-D-Arg-Gly-Arg-pNA), 15.4 mg, synthetic thrombin inhibitor, 0.4 mg, and mannitol added as a bulking agent. Reconstitute with 12.0 mL of sterile water or NCCLS type II water, to obtain a concentration of 1.8 mmol/L. Stability after reconstitution: 3 months at 2-8°C. Factor IXa + factor X 9.2 IU, 1 vial. Lyophilized bovine factors IXa and X with bovine albumin added as a stabilizing agent. Reconstitute with 10.0 mL of sterile water or NCCLS type II water. Stability after reconstitution: 12 hours at 2-8°C. The solution can be stored frozen in aliquots at -20°C (or at lower temperature) for 3 months. Do not refreeze. CaCl2 6 ml, 1 vial. Calcium chloride solution, 0.025 mol/L Ready to use. Opened vial is stable 3 months at 2-8°C. Buffer, stock solution 20 mL, 1 vial. 20 mL concentrated Tris buffer containing NaCl and BSA. Characteristics of tenfold diluted buffer: Tris 0.05 mol/L, pH 7.3, 10 mg/L Ciprofloxacin and 1.0% BSA. Dilute 1:10 (1+9) with sterile water or NCCLS type II water. Prepare a new buffer working solution each day. Once opened the buffer is stable 3 months at 2-8°C. Phospholipid 2 mL, 1 vial. Mixture of highly purified phospholipids and 10 mg/L Ciprofloxacin. Ready to use. When kept at 2-8°C the sealed reagents are stable until the expiry date printed on the label. In the presence of calcium and phospholipids, factor X is activated to factor Xa by factor IXa. This generation is greatly stimulated by factor VIII, which may be considered as a cofactor in this reaction. By using optimal amounts of Ca2+ and phospholipids and an excess of factors IXa and X, the rate of activation of factor X is solely dependent on the amount of factor VIII. Factor Xa hydrolyses the chromogenic substrate S-2765™ thus liberating the chromophoric group, pNA. The color is then read photometrically at 405 nm. The generated factor Xa and thus the intensity of color is proportional to the factor VIII activity in the sample. Hydrolysis of S-2765™ by thrombin formed is prevented by the addition of the synthetic thrombin inhibitor, I-2581, together with the substrate. Factor VIII is a non-enzymatic plasma protein that is essential for normal blood coagulation. The deficiency of factor VIII activity in humans is associated with a congenital bleeding disorder, called hemophilia A, which affects about 1 in 5000 males. Hemophilia A patients are treated with factor VIII concentrate for maintenance of normal hemostasis but regrettably prophylactic treatment is not in general use worldwide. During later years recombinant factor VIII has been approved for therapeutic use, which minimizes the risk of viral transmission. There is now also growing evidence that elevated factor VIII activity is a risk factor for thrombosis. Hence, factor VIII levels are of importance to measure not only for diagnosing and monitoring hemophilia A but also for thrombophilia investigations. With the advent of chromogenic substrate technology accurate and sensitive methods are available for quality control and for the clinical coagulation laboratory. It is the purpose of this monograph to present an overview of biochemical and clinical data on factor VIII and to provide comprehensive information on methodological aspects and on the use of the Coamatic® and Coatest® Factor VIII kits.